Wales denied former champions England maximum points on day one in the SHOP.CA WSF Women’s World Team Squash Championship when Tesni Evans sensationally beat world No.2 Laura Massaro in four games in the opening tie in Pool B of the biennial World Squash Federation championship in Canada. 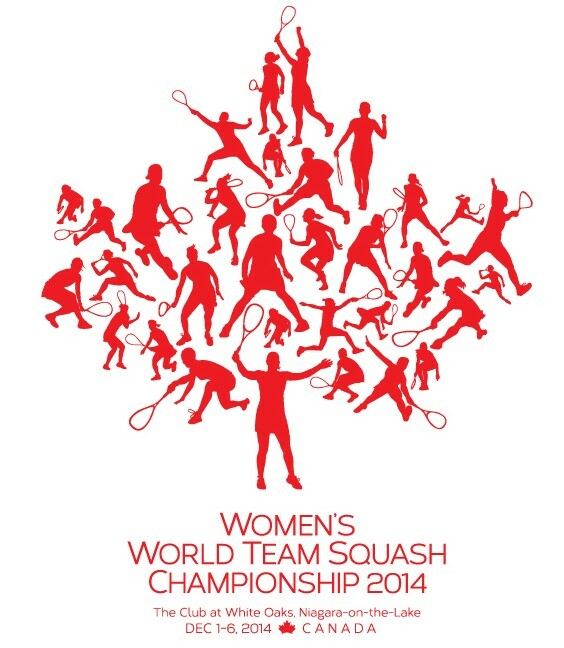 20 nations are represented in the 19th staging of the women’s world team championship at White Oaks Conference Resort & Spa in Niagara-on-the-Lake, Ontario. Six-time champions England are seeded to reach the final for the 11th time in a row since 1994 – and duly took the lead against the 10th seeds when world No.5 Alison Waters beat Welsh number two Deon Saffery 11-8, 11-9, 11-8. Evans, who last met Massaro in the 2012 championship in France – where she went down in straight games – ignored the script in the second match between the two top strings when she took the first game. Massaro, the reigning world individual champion, regrouped to draw level – and led in the third. But the plucky Evans, the 22-year-old world No.28 from Rhyl, reclaimed the initiative to take the third game and maintained the upper hand in the fourth to close out the match 11-6, 7-11, 12-10, 11-6 after 40 minutes. “That’s definitely my biggest win,” said the delighted Welsh underdog later. “I was totally relaxed – there was no pressure on me at all. It’s amazing when you think what she’s achieved. “After I won the first game, I thought I’d get chopped. It was only at 9-5 in the fourth that I thought ‘I could win this’! It’s definitely given me loads of confidence. 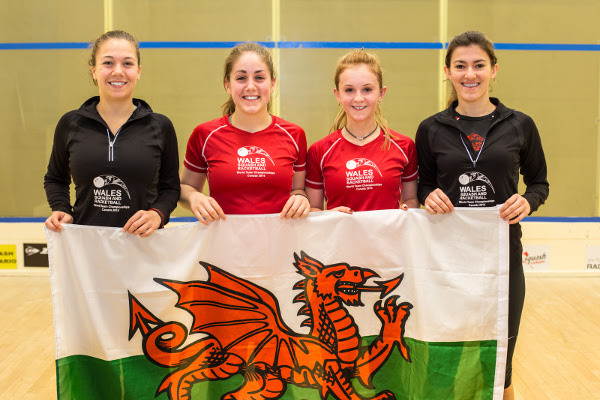 National coach David Evans was full of praise for his number one: “Tesni (pictured above, second left, with team-mates (L to R) Deon Saffery, Elin Harlow & Jennifer Haley) played really well, and was successful in trying to break Laura’s rhythm. “That was really good for her confidence and shows that she’s on the right path. Laura never makes things easy for her opponents. 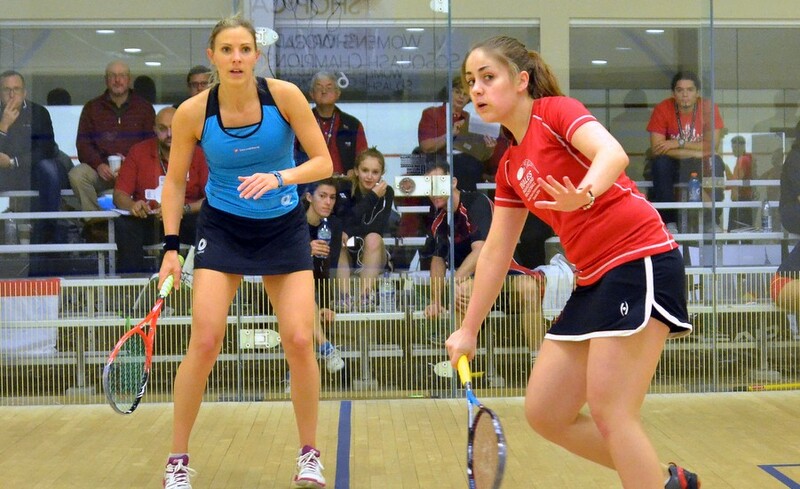 England went on to win the tie 2/1 after Emma Beddoes beat Elin Harlow 11-5, 11-3, 11-3. Later in the day, England maintained their winning ways by despatching Germany 3/0, while Wales recorded their first win by beating Spain 3/0. Hosts Canada also had a tough opener in Pool C, against third seeds Malaysia. 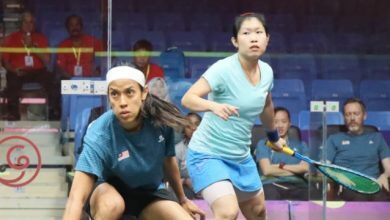 In the first battle on the venue’s spectacular all-glass showcourt, world No.7 Low Wee Wern put the Malaysians ahead by beating Canada’s championship debutante Danielle Letourneau 11-6, 11-2, 11-5. 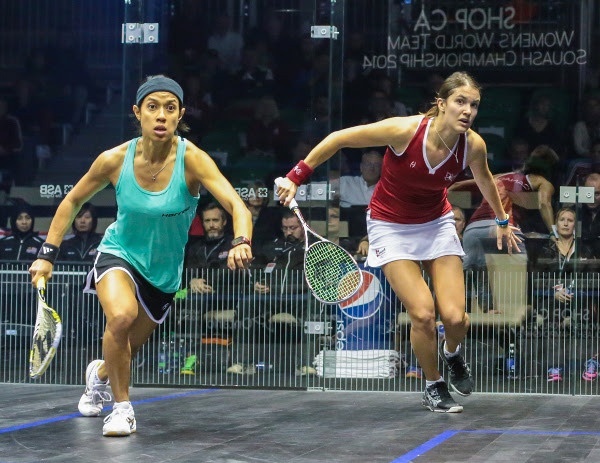 Seasoned Canadian Samantha Cornett dug deep in her battle against Malaysia’s world number one Nicol David – unbeaten in the event for ten years – and forced a fourth game after taking the third. David stopped the rot and clinched an 11-6, 11-8, 9-11, 11-3 victory in 50 minutes before team-mate Delia Arnoldovercame Canada’s second event first-timer Nikki Todd 11-6, 12-10, 11-5 to record the predicted 3/0 win. Later in the day, Canada notched up their first win by beating event newcomers Guatemala 3/0. Cornett, the world No.31 from Ottawa (pictured above, right, in action with David) who is making her third successive appearance in the championship, was overjoyed to be competing on home soil. “It’s the biggest event I’ve ever played in in Canada,” said the 23-year-old. 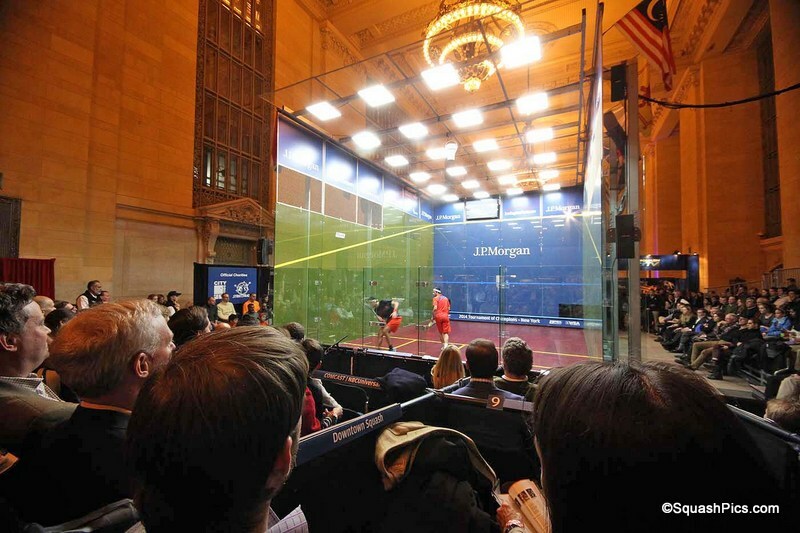 “When I first saw the glass court here I thought it was just so cool. It’s really exciting to be playing in front of friends and family. Team coach Melanie Jans, the former world No25 and one of Canada’s greatest female players, was pleased with her team’s performances. “It’s so special to be involved in this event here in Canada – particularly playing here at this great venue which is without doubt the best facility anywhere in the world for a championship like this. Not only can we walk from the rooms to the courts – but we can also walk across the road to this amazing shopping mall. “I’m really excited by our young squad, in which Sam is a ‘veteran’ at 23! And even two years down the line, we’ll still have a really young team. Favourites and defending champions Egypt – all of whose players are in the world’s top 10 – maintained a clean sheet on day one by beating 9th seeds New Zealand 3/0.